You asked and we listened! With a large mom, homeowner and family base, one of the features our users asked for was to see reviews from people similar to themselves. 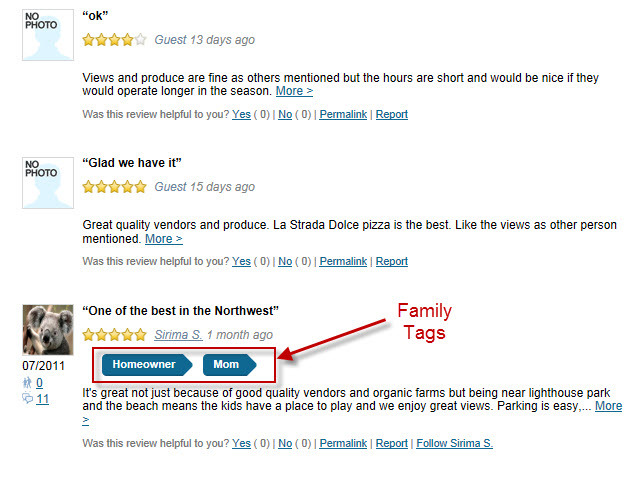 When reading a review our users want to know if a mom, dad, or homeowner wrote the review and where the person lives. For a mom in Albany reading a review, one written by a single student from Manhattan is much less relevant to one from a mom in her own area. To see tags, simply write a review Judy’s Book has started asking users to tag themselves with a few simple tags; Mom, Dad, Homeowner. Users who tag themselves have their tags displayed in results and reviews to help our community find relevant results faster. In the future we’re going to add filters for users to quickly find reviews by a certain tag. If you have an idea for a tag you’d like to see added let us know by e-mailing info@judysbookteam.com. This entry was posted in Judysbook on September 23, 2011 by judysbookblog.